Monkeys inhabit the lush forest surrounding ancient Mayan ruins once considered sacred. Visiting the sprawling ruins of the Mayan city of Tikal makes for an eerie and timely lesson on the fragility of human societies. Here the most powerful civilization of Mesoamerica ruled supreme before its mysterious collapse and the encroachment of the forest. But a denizen of the jungle that has witnessed the rise and fall of the ancient Maya still lingers on. These are a primate known as Geoffrey’s spider monkey, a species that is native to the rainforests of Mexico, Central America, and parts of northern Colombia. One of the largest New World primates, they live in troops of between 20 to 40 individuals and feed upon the ripe fruit and leaves provided by the many tree species of the forests. In turn, the seeds are dispersed over vast distances by the monkeys, who are one of the many animals that ensure the forest’s growth. 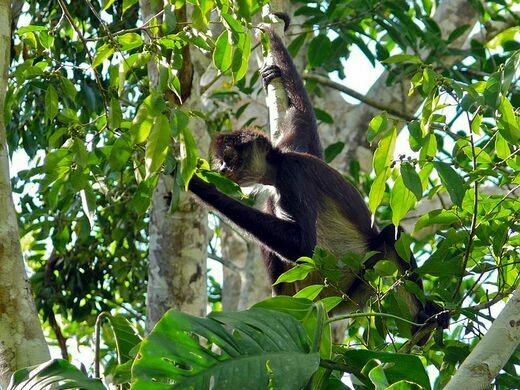 This remarkable animal may be observed easily by visitors at Tikal, as it brachiates through the liana laden boughs of the great ceiba trees with a grace that would make even the most talented circus acrobat jealous. The monkeys possess a prehensile tail which has evolved to serve as a dexterous fifth limb, and which is used with remarkable agility in locomotion across the canopies. 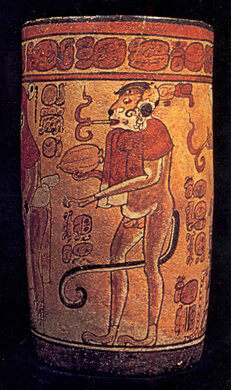 In the Mayan civilization, the monkey was considered a divine animal imbued with profound cultural significance. Although the Mayans held no concept of the scientific theory of evolution as it is currently understood, they conceived of monkeys as being the venerable ancestors of humankind. The sacred book of creation myths, the Popol Vuh, related that primates were a lifeform that had arisen during one of the many earlier experimental periods of creation by the gods. According to the myth, the gods were ultimately disappointed with the result, which they found to be too frivolous and rebellious and thus strove to perfect and shape the form of some of the monkeys. In the process of the modification and reshaping, the gods managed to create the human race, and feeling content with their invention gave this “primate 2.0” permission to rule the Earth. As the forerunner of the human race, the monkey, therefore, was perceived to occupy a semi-sacred role within the complex cosmovision of the Mayans. The two types of monkey that inhabit the forests of northern Central America, the howler monkey and the spider monkey, were seen to represent different aspects of the divine. The howler monkey (known as “Batz” in the Mayan language), due to its more somber and reserved appearance, was connected with seriousness, duty, and work, and therefore associated with scribes. 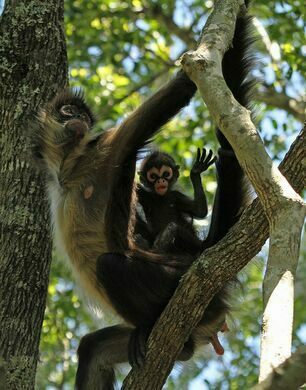 The more active, intelligent, and mischevious spider monkey (or “Ma’ax” as it is known in Mayan) meanwhile was associated in a “Joie de vivre” manner with the affirmation of life, joy, celebrations, creativity, sexuality, and pranks. Today the spider monkey is an endangered species across much of its range. It has vanished from many of the regions in Central America where it was once abundant as the rainforests are felled for timber and are replaced by farmland. Fortunately, however, in Guatemala’s Tikal National Park, at least for the time being, this sacred simian continues to cling to survival, as it has done for thousands of years. 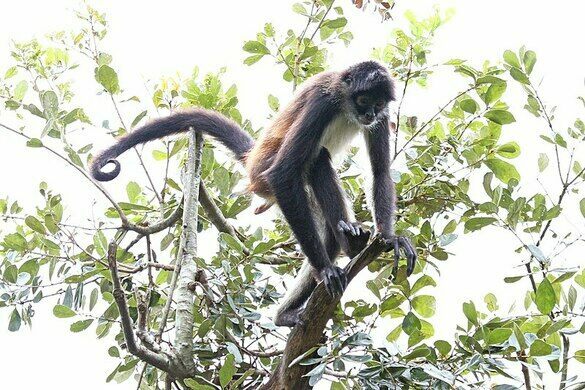 The spider monkeys (and their howler monkey relatives) can be seen relatively easily on most of the trails around the Tikal Archeological Site and National park. To avoid being defecated or urinated on by monkeys (it happens surprisingly frequently), try to avoid standing directly underneath the trees they are sitting in and instead observe them from a distance with binoculars. Please don't feed the monkeys with human food as these can make them sick and encourage an unhealthy habituation to human beings. The remnants of an archaeological camp stand within Tikal National Park. One of the world's largest pyramids stands within El Mirador, the "lost city of the Maya." Belize cave containing the sparkling, calcite covered skeletons of Mayan children, sacrificed to the rain god. A hidden treasure of an abandoned city lies deep in the jungles of Campeche, Mexico. This mysteriously shaped boulder may have been used for human sacrifice in ancient times. This ancient altar emerges from the thick forests to reveal the mysteries of Etruscan sacrificial rituals.